These are easily the BEST nurses socks! I was late to the whole compression sock scene, and I regret waiting so long! These were created by an ICU nurse and you can’t beat the great designs!! Three lucky winners will get to treat their legs with love with their own pair of Nabee Socks! Medical Scrubs Collection, a fantastic scrubs company located in New Jersey wants to give a lucky winner a pair of Grey’s Anatomy scrubs! They specialize in extraordinary customer service, coupled with a love for the “Heroes in the Scrubs”. They offer top quality at excellent prices, frequent sales, rewards points, and the newest scrubs when they’re still new. Go show them some love!! Well this year, one of the most compelling books about nursing came out – The Nurses: A Year of Secrets, Drama and Miracles with the Heroes of the Hospital. I was truly mesmerized by how author Alexandra Robbins so accurately described the life and work of nurses. You can read more about my gushing over this book here. OH MY WORD is all I have to say! One lucky winner is going to get an awesome hard copy!! Tired of wearing you stethoscope around you neck? Not only is it painful on you neck after a long shift, but its not good for your stethoscope. The Lotus Stethoscope Holder was invented by a nurse, so she knows the needs of nurses. The Lotus is so versatile – wear it how you like – on your scrubs or even on your bag to carry it with ease. They come in 5 great colors – hot pink, white, navy blue, light green and black. And FOUR lucky winners are going to get one – yahoo!! We all need scrubs that are technical and comfortable. We need scrubs that support us at work in every way. Fabric technology is at the core of our products for the most innovative medical apparel to keep up with the dynamic lives of busy medical professionals. The fabrication in all our scrubs integrates technical details like antimicrobial enzyme washes, yet is the softest and most breathable material found in the industry. We craft clean, modern and minimalist scrubs that incorporate the functionality required without sacrificing the aesthetic desired. From thoughtful pocket placement to the streamlined relaxed fit, each detail serves to complement your silhouette and to optimize the functionality of your work wear. This is Technical Comfort™. Welcome to FIGS. One lucky winner is getting a wonderful pair!! If you’ve been around the nursing social media / web world – you likely have come across Kati Kleber – better known as Nurse Eye Roll! Last year she put together all her straight talk, encouraging advice in Becoming Nursey: From Code Blues to Code Browns, How to Care for Your Patients and Yourself . She continues her love for nursing by giving away an autographed copy to one fabulous nurse! Many nurses fret about “being sued” and more importantly, loosing their precious license. But Lorie Brown, RN, MN, JD has some words of wisdom for you in Law and Order for Nurses: The Easy Way to Protect Your License and Your Livelihood . She shares her stories and experience in protecting nurses as they fought to protect their most valuable asset, their license. She is giving away one free copy of this valuable book!! Uniform Advantage is celebrating 30 years providing scrubs, shoes and all things that nurses would need to make it through a shift. The strive to provide the best selection of scrubs and nursing uniforms at prices that can’t be beat, including their own exclusive brand – UA Scrubs – which includes Butter Soft scrubs – and they ARE butter soft! So, to celebrate their love for nurses, they are giving a $50 e-gift card to one lucky reader!! If you are looking for some cool things to make your day better- pocket cards, reference books, tools of the trade or the very Whitecoat Clipboards – MD Pocket has what you need! Since 2005, they have been publishing professional academic books and reference guides with the emphasis on educating all healthcare professionals. In fact, you can even have their pocket books customized for your needs. To show their support for nurses, they are giving away a basket of nurse goodies to one lucky reader!! Goodies include the following items for a total value of over $100!! What could feel better after a long shift, than a nice heat pack to the lower back or neck! These unique heat / cool therapy pads are made from cherry pits and can be found at Nurse Born Products. The cherry pits are from a pitting factory in the USA and are sanitized before used for the therapy pads. They can be warmed in the microwave or placed in the freezer – what ever your needs. One lucky reader will get a beautifully wrapped Cherry Tree European Style Heat Therapy Pad to snuggle up with after a long shift!! WOW! Can you believe all that nursing love!! Here’s how you enter & the rules – only open to US residents (shipping reasons, sorry) and just enter via the Rafflecopter below! The drawing will close on 5/12/15 at midnight & the SIXTEEN winners chosen and contacted the following day. If I am unable to get in contact with the winner in 72 hours, will draw another winner! Super easy! Good luck & feel free to share the love! 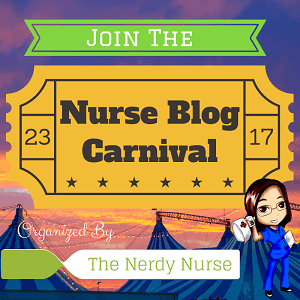 Fun Stuff, Patient Education, Student Nurses, Uncategorized giveaway, Nurses Week, Nursing, student nurses. permalink. I love a good pun! And funny thing, my husband got Lifesavers this year! You are so on trend Lindsey!! Worst gift for nurse’s week…… a small pin. … to hang off the 5000 other things on your badge, right? My best nurses week gift was a 30 minute massage I won yesterday in a raffle!! ooohhhh…that would be nice!! Congrats on the massage!! Anything free, I’ll take it. We are an Amazing Nurses! Empower our passion and drive to make a difference. Nurses, check out the awesome lanyards from my personal site (www.hellochloe.origamiowl.com). Unique and versatile. Give yourself a gift because you deserve it. Give a gift to a special nurse because he or she deserves it. We work quite hard but hardly appreciated. Love yourself more and surround yourself with those that lift your spirit up. I love a grateful heart! Can’t turn away a free meal!! Just as long as you get time to eat too! Best gift was a gift card for a coffee shop..worst gift was nada. 🙁 Thanks for the chance! its my first nurse week ever and im at home sick so nothing yet. oh no!… hope you feel better & no one steals your gift!! And welcome to nursing – may you have many more fabulous Nurses Weeks!! I know it’s the thought that counts, however, the worst gift was a small pin with the mission statement of the hospital: I.C.A.R.E. uph…that is rough. Better than nothing? ?… the million $ dollar question…. Worst gift is all the candy!!! I can’t resist!! Best gift: phone call with a patients long distance family thanking me. (heart melting) FOR SURE!! Nice to know we are appreciated in such a thankless job! This is my first ever Nurse’s Week! I’m still a very, very new nurse; I’ve been employed less than a month! I’m thankful for all these helpful sites and nurses alike. It’s so easy to feel a lil lost sometimes. Lucia – CONGRATS on graduation and the new job!! Welcome to nursing!! Glad you have connected with a community – it can feel very overwhelming sometimes, so don’t be afraid to reach out!! Please let me know if I can ever be of any help – love new nurses – you are our future, we have to take good care of you!! Congrats & Happy FIRST Nurses Week!! Happy Nurse’s Week! Thank you for all your dedication to health and wellness. Happy Nurse’s Week to you too Michelle!! Thanks for stopping by and your kind words! Happy FIRST Nurse’s Week to you too!! Exciting year for you! And the suspense… you will have to let us know what you got… a mug, pen or the popular pin? Thanks for the giveaway can’t wait to see all your post on Pinterest! Thanks Nicole – wanted to share some love to my readers!! And totally join me on Pinterest – I LOVE it and am pretty addicted! Always looking for community board members to pin with too! I am excited to celebrate my first official nurses week! I would love to win one of the amazing prizes! Another Happy FIRST Nurses’ Week! Congrats & welcome to the profession Alia! I hope you win also!! This is my first Nurse Week and at the hospital we are big on celebrating! I would say the best thing would be scrubs! Happy FIRST Nurses Week to you too Macy! You are lucky your hospital still celebrates BIG! New scrubs are always awesome… a pin or sticker, not so much! Thanks for stopping by!! A person who goes right for the practical!! I love it!! Wow – did you really GET a pair of Danskos?? That would be amazing!! And definitely, no gift is a bad gift… even a bad gift had some thought in it!! Happy FIRST Nurses’ Week Alyssa!! Welcome to a fantastic profession and keeping being proud!! We need more like you!! Did you get anything good this year?? Best gift for anything is a free delicious meal! Can’t turn away some good chow! I would have to agree! Well… thats a new one for me! At least it was yummy!! Needless to say the worst present was nothing. And I have to say the best gift was a large bag that I carried for 15 years to work E V E R Y D A Y!! WOW. When I announced …I think I’ll get a new nursing bag…my husband and I laughed after I realized I carried one bag for 15 years!!!! Best gift: acls book, book on how to invest, and a restaurant gift card by my preceptor! Thanks so much for the giveaways! !